Firefighters and bomb disposal crews were called to a blaze at farm buildings in Essex containing bullets, shells and landmines. 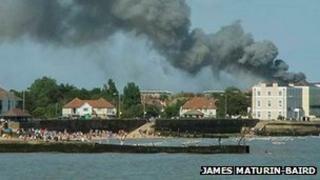 Crews were called to Old Hall Lane, Walton-on-the-Naze, at about 15:00 BST. A 300m exclusion zone was set up as the workshop area contains fuel, cylinders and ammunition. The fire was extinguished by 19:00. Firefighters were able to enter after bomb disposal crews deemed the building safe. Some homes were evacuated as a precaution but all residents have now been allowed to return home, the fire service said.